Most people refer to it as Taco Tuesday, but I like to refer it as Taco Everyday! 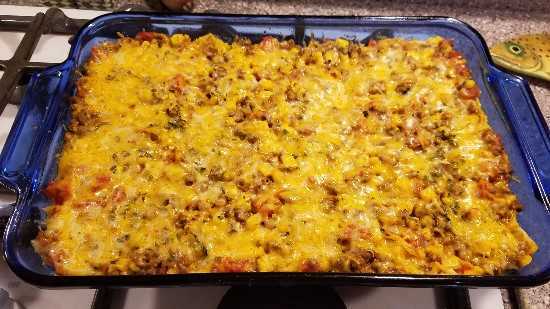 And since Taco is part of Taco Casserole, it counts in my recipe book :) So, if you are looking for something delicious to do with your hamburger meat, make Taco Casserole! Of course you can adjust this recipe, but here's a good version that I left out the heat from so the non-heat eaters can enjoy it too. Heat 2 tablespoons of olive oil and diced onions to your pan and cook onion until clear. Add garlic and cook for a minute or 2. Add ground beef and cook until brown, drain oil and return to pan on medium heat. Add 2/3 cup water, taco seasoning and mix well. Layer triangle corn tortillas on the bottom of greased 13x9 dish. Add half of your mixture. Spread 1 cup shredded cheese. Add corn chips as 2nd layer. Add remaining mixture and spread remaining shredded cheese. Cover with foil and bake at 350 for 20 minutes, remove foil bake another 10 minutes.